President Muhammadu Buhari’s Personal Assistant on Social Media, Lauretta Onochie has lambasted the President of the Christian Association of Nigeria, CAN, Reverend Samson Ayokunle. 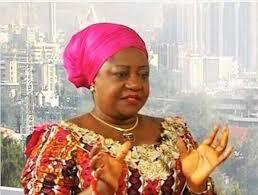 Onochie said Ayokunle was not for Jesus Christ for attacking Buhari over his appointments. In an open letter which she signed, Onochie insisted that Ayokunle had repeatedly accused President Buhari for always appointing Muslims, which she claimed was false. The letter reads, “Dear Dr. Samson Olasupo Adeniyi Ayokunle, I greet you in the name of whatever you hold sacred. It’s definitely not Jesus Christ. Mammon, commonly known as money, is my first guess. “I have chosen to write you this letter, believing in my heart, based of your utterances, that you have strayed from the path of righteousness, peace and love; paths, ordained by God for his sons to follow. That is, if you were ever on that path. “I do not really understand what you, as the leader of the Christian Association of Nigeria (CAN), stand to gain from constantly misinforming Nigerians. You keep harping on the lie that appointments made by President Buhari and VP Osinbajo, were lopsided. “It has been the case that each time appointments are made, CAN would not bother to check the merits of such appointments nor the constitutional rights of Mr. President to make such appointments. It does not bother you whether the appointees are qualified or not. The prerogative of CAN, under you, Sir, and for selfish reasons, is that members of your religious organizations only, are appointed as a way of boosting your income throw tithes and offerings that accrue to you. “Vice President Osinbajo, a Christian Pastor himself, has severally, debunked the myth, the lies and fabrications about and around appointments coming from your angle. Each time, he does it with facts and figures. And then you wait for the next appointment to regurgitate the same evil sentiments. “But you Sir, President of CAN, Dr Samson Olasupo, continues to misinform and to incite animosity against a government that is reaching out to the poorest in our society, where figures show there are more Christians in government and where your Christian “brother” is the number two man. “We all know that there’s no correlations between performance-based appointments and religion nor ethnicity. If there was, Ex-Pres. Goodluck Jonathan, who crawled from one Christian prayer house to the other, would have been the best President Nigeria ever produced. “Under him, funds allocated for federal projects in Christian dominated South were looted as the funds for the Muslim dominated North. Part of the loot, happily received by people like you in the name of tithes and offerings. Please show Nigerians where you condemned the heist and that act of treachery perpetrated by your affiliate party, the PDP. “It’s on record that this government has fulfilled the quota system and the federal character requirements in federal appointments. Christians who have been appointed into this government, know that the budget for their MDAs, are for the people of Nigeria, and not for tithes and offerings. They are real Christians who fulfill their religious obligations to their churches without dipping their hands into the treasury. They will not shortchange the people of Nigeria in the exercise of their national calling in order to swell the greedy purse of men who pretend to be God. “My experience over the last four years has been that many Nigerians who approach government functionaries want something for themselves alone. Your role as a Christian(?) Leader is to educate our people in selflessness and preach harmony, love and peace, attributes Jesus and Pastor Kumuyi of the Deeper Life Bible Church are known for. “President Buhari is ALL about the common man: the weak, the poor and the vulnerable. He will continue to defend and protect our treasury for the benefit of all Nigerians, from people like you who hide behind the cloak of religion to advocate selfish interests and corruption. “The problems of our nation are corruption, tribalism and religion, thanks to unrighteous preachers. These problems are key in hampering Nigeria’s development. And you are fuelling these problems by what you say and what you fail to do. “Misinformation is a fancy word for lies and bearing false witnesses. We all know what the working document of CAN, the Bible, says about lies, bearing false witnesses and liars. “The bible frowns seriously at lies and deliberate misinformation. According to the Bible, the righteous hates falsehood, but the wicked brings shame and disgrace. You, Sir, can now see that you are not a righteous man as you love falsehood and strive to disseminate it. “The bible did not stop there, it says that the hottest part of hell, is reserved for liars. Chew on that. “If you have a deep-rooted hatred for Muslims, go on your knees and ask God to forgive you. It is God who decides what religion we take by causing people to be born into specific families. If its the government you hate, you can start by trying to love VP Osinbajo who is also Christian. “You have continued to open your mouth and allow your predecessor to speak through you. You believe and have voiced that Nigeria’s leadership of today is not the best. Well, PRESIDENT BUHARI did not emerge through the barrels of the gun but through the expression of the popular will of the people of Nigeria. Nigerians who elected him adjudged him the best. However, that time is here again with us. Please present your best candidate and let’s see how he/she measures up to the one you despise. “Listen, Nigerians are at their wits end with pretenders to the throne of God, Christians and Muslims alike, like you. They want to be left alone to continue to live as a people. Your role is to support them by emulating Jesus Christ in preaching love of one’s neighbour. Since you appear to be far from Jesus, try to emulate Christian leaders like Rev. Mbaka and Pastor Kumuyi. That’s how you can be a great Christian leader.